'White Lilacs' (Bee Warburton, R. 1983). Seedling #59AA-3. IB. Height 27" (69 cm). Early to midseason bloom. 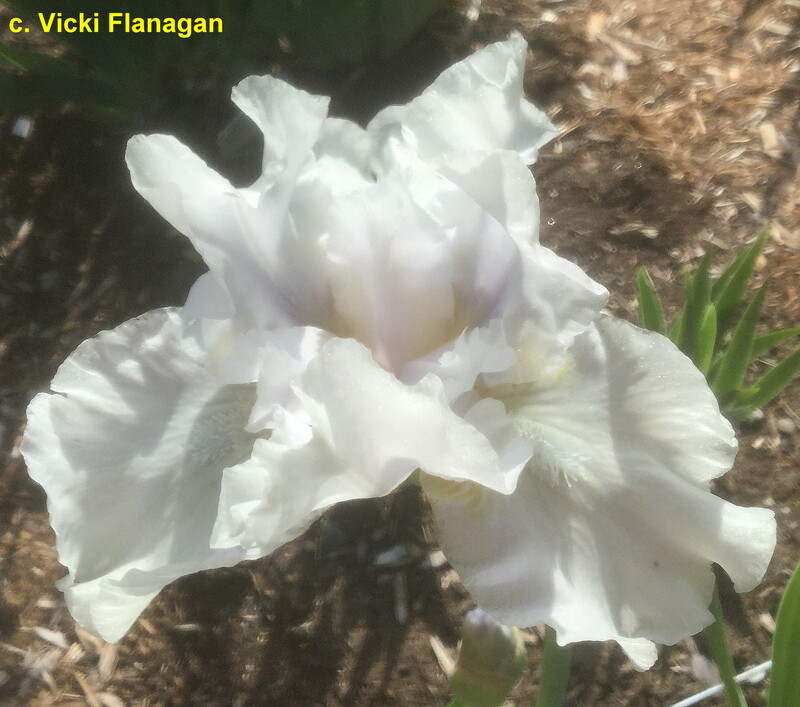 Ruffled pale lilac (lighter than RHS 91 D), green tint (152D) at hafts; pale lilac beard; pronounced sweet fragrance. 'Full Tide' X seedling #27Y-7: ('Gentle Air' x (seedling #14S-3, involving luminata/plicata lines, x 'Open Sky' sibling)). Warburton 1984. Garnered Perry Dyer's DARK HORSE AWARD in 1998/99. HE SAYS: " I'm amazed that any introduction from this matriarch median hybridizer could go unnoticed. The lack of notoriety for this classy cool white Intermediate is just unforgivable. Incredible placement of branching and sheer bud count, good growth. All the other characteristics are prime. But the calling card for White Lilacs is its elegant flower. A cold-cold icy white, heavily infused with a cool lilac throughout the flower. Heavily ruffled, carved into the flower. It glistens in the sunlight. " JPG whitelilacs.JPG manage 671 K 02 Aug 2018 - 01:48 Main.TLaurin Photo by Nancy McDonald-The Pickle Barrel Collection.